It’s time to unlock the performance in your F32. 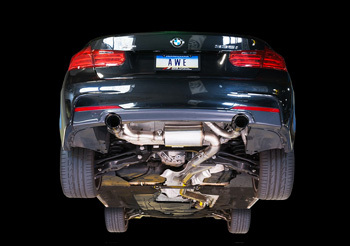 Presenting the AWE Tuning BMW 435i Exhaust Suite. Hundreds of hours of research, prototyping, engineering, testing and daily usage evaluation plus over two decades of performance engineering for European autos has yielded the ultimate exhaust for the BMW F32 435i. This Axle Back F32 435i System is comprised of the 435i Touring Edition Exhaust and 90mm, dual walled, AWE Tuning branded tips, in Chrome Silver. Engineered, designed and manufactured in house at AWE Tuning. If you already have an AWE Tuning axle back 435i Touring Edition Exhaust and are looking to add the Performance Mid Pipe, drop us a line here. All products are confirmed to fit both RWD and X Drive vehicles. The AWE Tuning Touring Edition Exhaust is an axle back system that leverages AWE Tuning’s proprietary sound cancellation solution, 180 Technology™, to produce the perfect exhaust note, drone free. If you’re unfamiliar with 180 Technology, learn more through this brief 180 Technology video. The AWE Tuning Performance Mid Pipe is a key component in obtaining the perfect signature aggressive yet sophisticated note from the exhaust. This non-resonated piece removes the factory resonated section and replaces it with straight through 3” T304 stainless steel tubing. Perfect tone comes compliments of AWE Tuning 180 Technology™ . As exhaust gases exit the 335i engine and flow into an AWE Tuning 180 Technology™ equipped resonator, they pass through strategically located ports, and into reflection chambers. Sound waves, carried by these exhaust gasses, bounce off the walls of the reflection chambers. By controlling the size and location of the ports and the chambers, we also control when the sound waves exit the chambers. The specific timing of when the reflected sound waves rejoin the main exhaust flow creates a one-hundred-and-eighty-degree out-of-phase sound wave that cancels out problematic frequencies. More on AWE Tuning 180 Technology in the tab above. Depending on which options you choose, the AWE Tuning BMW F32 435i Exhaust Suite includes the axle back AWE Tuning Touring Edition Exhaust itself, the Performance Mid Pipe, exhaust tips, and all clamps and hardware required for installation. AWE Tuning 180 Technology® works a little something like this: As exhaust gases exit the engine and flow into an AWE Tuning 180 Technology® equipped resonator, they pass through strategically located ports, and into reflection chambers. Sound waves, carried by these exhaust gasses, bounce off the walls of the reflection chambers. Depending on the sound requirements of each vehicle, AWE Tuning acoustic engineers adjust the size and location of the ports and the chambers. By controlling the size and location of these key elements, we also control when the sound waves exit the chambers. The specific timing of when the reflected sound waves re-join the main exhaust flow creates a one-hundred-and-eighty-degree out-of-phase sound wave that cancels out problematic frequencies. AWE Tuning 180 Technology® is not on a “one size fits all” concept. Rather, AWE Tuning engineers design sound cancellation resonators based upon the specific acoustics generated by vehicle types, thereby ensuring perfect sound, every time. It’s one of the reasons AWE Tuning exhausts have earned a reputation for the perfect tone, regardless of application. What it means to you. The result? The removal of unwanted tones in all AWE Tuning 180 Technology®-equipped exhaust systems. The sound produced by this formula is the perfect, signature note. Unlocked performance and spot-on tone, every time. A video's worth 1,000,000 words. 180 Technology® in action, below.